What an excellent topic for Science class today. Several inventors had built light bulbs, but they didn’t last very long. 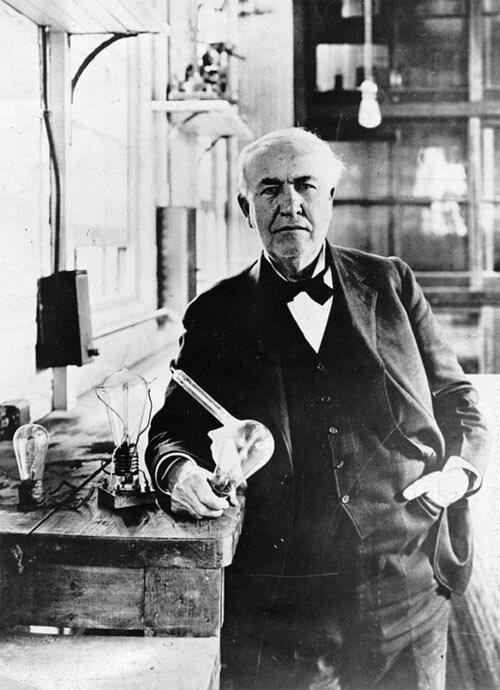 Thomas Alva Edison figured out how to make the first practical light bulb after years of research. He was a prolific inventor with over 1,000 patents including how to record sound and motion pictures. For the light bulb he figured out that he’d need a filament – that is something that glows – and it needed to be in a vacuum so it wouldn’t just burn up. A glass bulb would maintain a vacuum and let the light shine through, but the filament was a problem. He tried all types of exotic metals, including silver, gold and platinum, but eventually settles on carbon. One story is that he carbonized a piece of cotton thread for the filament. Today we use tungsten for the filament, but the rest of the design hasn’t changed much. They’re reliable – in fact there are several bulbs that were installed at the beginning of the twentieth century that are still burning today. Well, let’s Google that. Hmmm, it was invented back in 1976 by George Hammer who worked for GE , but they didn’t want to spend the money to manufacture them. Eventually, the Chinese started making them. They use less electricity than incandescent bulbs but the light is kind of funny colored. They’re supposed to last for five years, but around my house they seem to last about half as long as the old style light bulbs they replace. They’ve got mercury in them, which is a hazardous material. The expression “As mad as a hatter” referred to the fact that hat makers used mercury and as they absorbed it through their skin, they exhibited erratic behavior, so if you break one, you have a problem. There’s a phosphor inside that glows. That’s about the best I can do to explain it. Ooops, we’re out of time for science. Put your science books away and get out your social studies books so we can learn all about how Congress gets things done. This entry was posted in Business, Celebrity, Culture, Energy, Future, History, Media, People, Philosophy, Science, Solving Global Warming, Technology and tagged cfl, compact fluorescent lamp, General Electric, Google, Incandescent light bulb, Invention, LED, Light, Light-emitting diode, Thomas Alva Edison, Thomas Edison. Bookmark the permalink. There Nottin like puttin some LIGHT on the subject!